Granulocytes and agranulocytes are the two types of white blood cells found in blood. White blood cells are also called as leukocytes. They provide the front-line defense to fight against diseases. Eosinophils, neutrophils and basophils are the granulocytes. Monocytes and lymphocytes are the agranulocytes. Neutrophils and monocytes are the most active phagocytes, which engulf foreign pathogens and destroy them. T and B lymphocytes are involved in the identification of antigens, which are present in the antigen presenting cells in order to generate specific antibodies for a particular pathogen. The main difference between granulocytes and agranulocytes is that granulocytes consist of a granular cytoplasm whereas agranulocytes do not consist of a granular cytoplasm. Granulocytes are a type of leukocytes found in blood, containing a granular cytoplasm. Three types of granulocytes are found: neutrophils, eosinophils and basophils. The three types of granulocytes are distinguished depending on the staining pattern of granules in the cells. Since granulocytes contain different numbers of lobes in the nucleus, they are also called polymorphonuclear leukocytes. Neutrophils are the most abundant cell type in blood. They are one of the first cells migrating into the site of inflammation, following the cytokine signals produced by the infected cells. This process of migration is called chemotaxis. Eosinophils combat multicellular parasites like helminth. Responding to chemokine and cytokine signals, eosinophils migrate into inflammatory tissues. Along with basophils and mast cells, eosinophils mediate allergic responses and asthma pathogenesis. Basophils contain the anticoagulant heparin which prevents the quick blood clotting inside blood vessels. The enzymes in their granules are also released during asthma. Basophils are the least common in blood compared to other granulocytes. But, the largest granulocytes are basophils. Agranulocytes are the other type of leukocytes; they do not consist of cytoplasmic granules. Two types of agranulocytes are found: lymphocytes and monocytes. 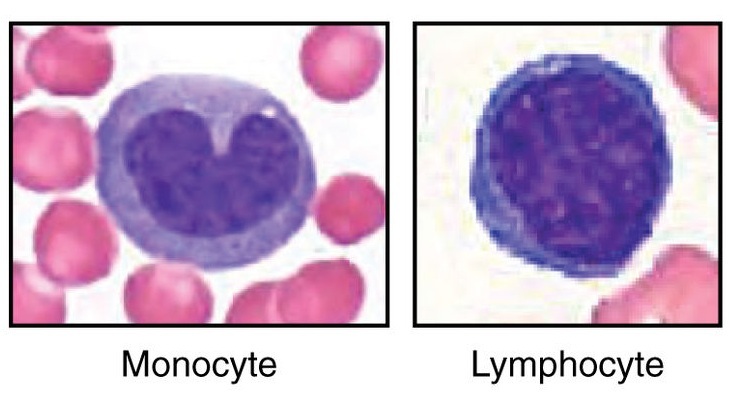 Lymphocytes are again divided into two groups as T lymphocytes and B lymphocytes. Agranulocytes are also called mononuclear leukocytes since they contain a non-segmented nucleus. Agranulocytes are less abundant in blood when compared to granulocytes. Monocytes are capable of migrating into infected tissues by differentiating into macrophages. They are capable of being differentiated into dendritic cells as well. Monocytes are involved in the innate immunity of an organism, serving as the front-line defense of the host. They also allow the adaptive immune system to be activated by triggering an inflammatory response. Monocytes secrete cytokines and chemokines. Monocytes migrate into tissue within 8-12 hours, responding to inflammation. Mature T lymphocytes express T cell receptors (TcRs), which are capable of recognizing specific antigens presented by the antigen presenting cells. Three types of T cells are there: T helper cells, T cytotixic cells and T suppressor cells. T helper cells affect B lymphocytes by activating them to produce specific antigens to a particular pathogen. T cytotoxic cells are cytotoxic against tumor cells while presenting the antigens of pathogens as well. T and B cell responses are suppressed by T suppressor cells. B lymphocytes are activated by T cells, and the antibody IgM is produced as the primary immunization, which can be identified in the serum after 3-5 days of infection. A portion of B cells become memory B cells, storing the memory of invaded pathogens for long periods of time. Agranulocytes are shown in figure 2. Granulocytes: Granulocytes are leukocytes that contain a granular cytoplasm. Agranulocytes: Agranulocytes are leukocytes that contain an agranular cytoplasm. Granulocytes: Granulocytes are called polymorphonuclear leukocytes. Agranulocytes: Agranulocytes are called mononuclear leukocytes. Granulocytes: Eosinophils, neutrophils and basophils are the granulocytes. Agranulocytes: Monocytes, macrophages and lymphocytes are the agranulocytes. Granulocytes: Granulocytes are originated from the bone marrow. Agranulocytes: Agranulocytes are originated from lymphoid. Granulocytes: Granulocytes are 65% of total leukocytes. Agranulocytes: Agranulocytes are 35% of total leukocytes. Granulocytes: Nucleus contains two to five lobes in granulocytes. Agranulocytes: Nucleus contains a single lobe in agranulocytes. Granulocytes: Granulocytes contain enzymes, digesting phagocytized particles and inflammatory mediators into the blood stream. Agranulocytes: Agranulocytes are also contain enzymes in their lysosomes. Granulocytes: Granulocytes are mainly involved in the innate immunity, producing an immune response, which is non-specific to a particular pathogen. Agranulocytes: Agranulocytes are mainly involved in the adaptive immunity, producing an immune response, which is specific to a particular pathogen. Granulocytes and agranulocytes are the two types of leukocytes found in blood. They are distinguished by the presence of granular cytoplasm, which is stained differently under the light microscope. These granules contain membrane-bound enzymes, which primarily digest phagocytized particles. Eosinophils, neutrophils and basophils are the three types of granulocytes, which can be identified based on the staining properties of the granules in the cells. Granulocytes are also called polymorphonuclear leukocytes. Though agranulocytes do not contain cytoplasmic granules, they still contain non-specific azurophilic granules like lysosymes. Monocytes, macrophages and lymphocytes are the three types of agranulocytes. Agranulocytes are also called mononuclear leukocytes. Neutrophils are phagocytes, which engulf foreign particles and destroy them by enzymes. Monocytes leave the blood stream in order to function as macrophages in the infected sites. Eosinophils are involved in the killing of parasites. They have a role in controlling allergic reactions. Basophils contain heparin, which prevents blood clotting. Histamine is released from basophils during inflammation. T lymphocytes recognize antigens, which are present on the antigen presenting cells and induce B lymphocytes to produce specific antibodies. However, the main difference between granulocytes and agranulocytes is the presence or absence of cytoplasmic granules in each cell. 1. Goldman, Armond S. “Immunology Overview.” Medical Microbiology. 4th edition.